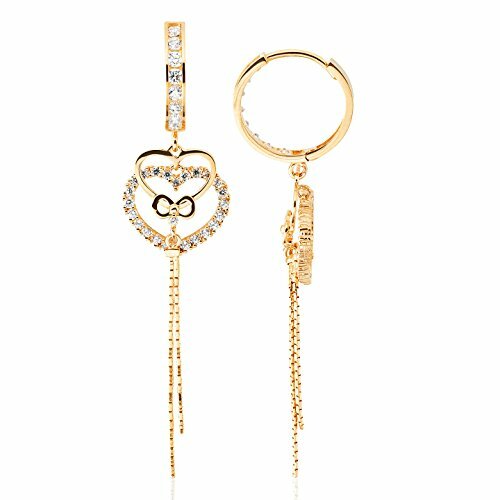 Sparkle and shine in these beautiful Heart and Bow Dangling Earrings from Jewel Connection. These sparkling earrings also feature a hypoallergenic finish making them safe to wear for those with sensitive skin. Delivered in a beautiful gift box, these earrings make the perfect gift for any occasion. ★ GOLD FOR GOOD: Made from 14K yellow gold, these Heart and Bow Dangling Earrings are perfectly suited for women and girls. This classic design will add elegance to any outfit. ★ SPECIAL PACKAGING: These earrings come in a Gift Box, so whether for you or a friend, the sparkling earrings arrive in a package appropriate to their style. ★SAFE FOR ALL: These sparkling earrings feature a hypoallergenic finish making them safe to wear for those with sensitive skin. ★THERE IS NO WAIT: Delivered FAST, these Heart and Bow Dangling Earrings get to you quickly so you can start wearing them when and where you want. ★THERE IS NO WORRY: Plus, these earrings come with a one hundred percent satisfaction guarantee, so if for any reason you are not satisfied with your purchase, simply return within thirty days.